» The Unlikables: How 5 Super Bowl wins and a potential 6th will never make the New England Patriots America’s Team. The New England Patriots are playing in their 10th Super Bowl this Sunday, an NFL record. The Patriots have a better-than-average chance of winning their 6th Super Bowl, which would tie another NFL record. America loves a winner. With all of New England’s success, why doesn’t America embrace them? Let’s go back to school. The reason we, everyone outside of Boston and the northeast, hate the New England Patriots so much has little to do with the football team itself but the B&B that make it go. The two-headed monster of Brady and Belichick are the quintessential jock and nerd we all love to hate. One head is Brady – the California golden boy with his dashing good looks, a supermodel wife and proto-type quarterback frame (6’4” 220 lbs.). The other head covered with a hoodie is Belichick. The headset-wearing genius who avoids eye contact and communicates with a monotone mumble. To the haters, Tom Brady represents that jock in high school who could do no wrong. You know the guy. He sweet talked the teachers into giving him good grades, excusing his absences and turning a blind eye to his debauchery. He was a criminal and a cheat but got away with everything because he had a charisma of “18” and he won football games under the Friday night lights. Brady stole your girlfriend and laughed at you, he had the best parties, he was like Jake from Sixteen Candles minus the humility and crush on a commoner. Despite his long con, Brady is utterly unlikeable. He reminds us of Stan Gable, famed quarterback of Adams College in Revenge of the Nerds. He’s cocky, manipulating and hated by everyone that is not on his team. That is the caricature of the Tom Brady we love to hate. On the other side of the coin in the valedictorian genius who made us all look bad in school. You remember this guy, the one your parents said to you ‘why can’t you be more like Bill?’ as you struggle with trapper keepers and Peechees. Bill was the nerd who got straight A’s, took calculus as a 6th grader, buses to college while in high school and sweeps the science and math fairs in the form of one William Stephen Belichick. Not only is Bill Belichick the smartest coach in the history of the NFL he’s also one of the hardest working. 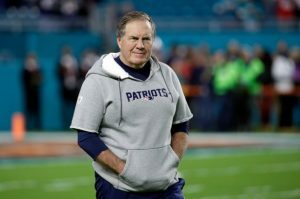 Chris Simm’s recently stated on the Dan Patrick Show that Belichick is grinding as hard in May as he is in January leading up to the Super Bowl. Who made who? A question AC/DC pondered that still goes unanswered today. A look at Belichick’s record as head coach of the Cleveland Browns reveals he wasn’t a genius, at least not then. With a winning percentage of .450 he was promptly fired after the 1995 season. In his lone winning season, he had a mediocre quarterback in the form of journeyman retread Vinny Testaverde. Genius and greatest coach ever weren’t thrown around in 1995. Belichick has a special unlikable quality which is unique to him. He treats the media, non-Patriot fans and people in general like garbage. 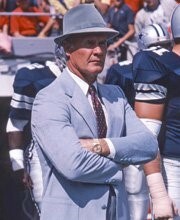 By contrast, when Tom Landry won Super Bowl’s he talked to the media, he did interviews – he was a likeable guy. Sure, he dressed like an insurance salesman but he was charming as you can see in this American Express Commercial. One guy created the 4-3 defense and the other was fined $500,000 for cheating and looks like he lives in a van down by the river. How unlikable are the Patriots? Let’s count the ways. It starts at the top. They are owned by a public drunkard. They are the Eddie Haskell of the NFL and find loopholes, bend rules and cheat like no other team in the history of the NFL. Play them in Call of Duty and they will camp and frag their own team. Play poker and there’s a card up their sleeve. them an inch, they take a mile – you get my point and you know people like this – and you don’t like them. This is the unlikable soul that is the New England Patriots. If greatness ever had an asterisk next to it, it would refer to the Patriots who play in the weakest division in the NFL. When was the last time Buffalo, the Dolphins or the Jets were relevant? Not this century. Play the weakest teams run by leagues dumbest mouth breathers and you have the AFC east, where New England has feasted since 2000. Is there any other franchise in the NFL with a more documented history of cheating, rule-bending and bullying than the New England Patriots? No, they truly have the dynasty on that. This is their 9th Super Bowl appearance but they have been caught up in as many cheating scandals. 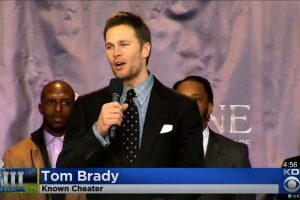 Including under reported deflategate, deflategate, spygate, cheating in Super Bowl XXXVI, cheating in the Super Bowl XXXIX, Brady bullies officials, list of NFL rule changes to stop Patriot cheating, the Brady rule, hiring a savant to bend rules and this what I found in just a ten-minute search. Joe Montana and the 49ers never had this reputation, the Vince Lombardi Packers were simply better than everyone else – the New England Patriots just bend the rules like no other and are celebrated for it instead of deplored for it. Is Tom Brady great? Yes, he is one of the greatest. 5x Super Bowl Champion, 4x Super Bowl MVP, 3x League MVP. Belichick, like Brady, will go down as one of the NFL’s greatest coaches. Patriots 35 Rams 31 Even a 6th Super Bowl can’t make you like these guys.